Tighten and firm your skin for a younger looking you. The RF Skin Tightening is a procedure that is a quick, safe, non-surgical process that is effective for skin tightening, wrinkle reduction and full body, face and neck rejuvenation. This innovative procedure heats up deep layers of skin, causing collagen contraction and long-term collagen rebuilding leaving you with younger looking skin. The radio-frequency (RF) energy uniformly heats the dermis while cooling and protecting the epidermis. It is designed to cause immediate collagen contraction followed by new collagen production which occurs over a period of time. The RF procedure is the only non-invasive method to tighten loose skin. Due to normal ageing process, the skin begins to sag and wrinkle. RF technology safely heats skin’s under layer and the web of collagen in the inner layer, causing an immediate tightening. This is a no pain, no down time treatment. Treatment feels like a hot stone massage. There is an immediate cool sensation. How Long Will the RF Procedure Take? Depending on the size of the area treated, the procedure itself may take approx 30 minutes to 60 minutes. You may return to your normal activities immediately, as there is usually no downtime. Minimal redness is seen in some clients but it usually disappears shortly after treatment. There is no special care needed after treatment. As a part of good skin care, sunscreen is recommended. You may start seeing some results immediately after treatment. Most significant results will be seen after 3-4 treatments. What Is RF Treatment Good For? •Tighten skin and decrease deeper winkles. 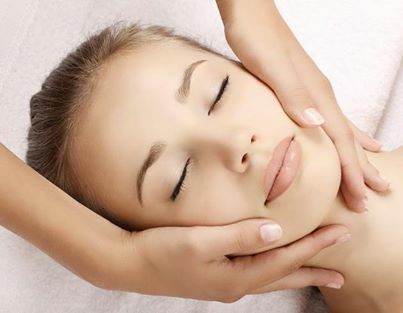 •Reshape the face outlines and produce some degree of a lift.